Wits Phola Coaches workers are expected to be insourced by October 1. CEO of Phola Coaches, Stephen Pitcher, made the announcement at a workers mass meeting on Friday morning, September 22. “We’re at a point where we will be able to reach a legal agreement probably within the next week or so,” he said. Pitcher added that Phola Coaches was aiming to transfer eligible employees to Wits by Friday next week. “The people that we have agreed, that are going to be moving over to be insourced, is going to be the drivers, the queue marshals, security and the cleaners,” he said. Wits will be insourcing 52 Phola Coaches workers in total, 37 of which are permanent bus drivers, six queue marshals, six cleaners and four security guards. There are three more bus driver positions to be filled. According to Bheki Ndlovu, Phola Coaches worker and workers’ representative, the workers insourcing benefits include an increase of workers’ salaries and they will also be able to bring their children to study at the institution, provided they pass grade 12. Some of the other benefits will be communicated at an offers meeting scheduled to take place in the next week, said Ndlovu. “This, we agreed is definitely a phase one, there might be another one, a smaller one a bit later. But this is certainly what’s on the table right now, this is what has been agreed,” said Pitcher to the group of workers. “I believe that the uniform and stuff are still delayed, but they will be made available in due course. We’re looking at having all the paperwork done by October 6 to make sure that all those people who are coming to Wits will get their salaries in October,”Kasonkola said. 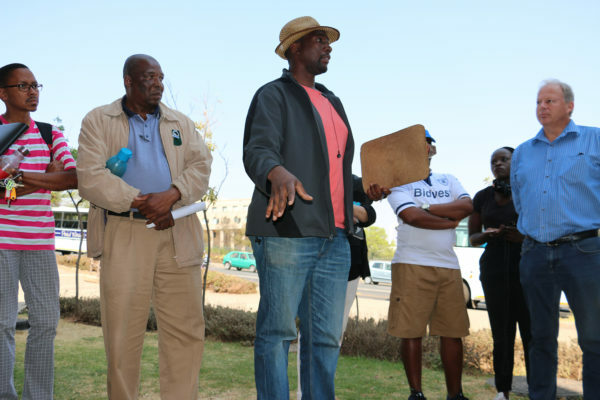 In addition to the insourcing of Phola Coaches workers, Wits Services operations manager, Timothy Modau said the bus drivers’ living arrangements had been sorted out. “It’s an overnight accommodation for eight drivers working at night. So that arrangement is concluded; four beds in each room, there are two rooms. It’s not a permanent accommodation. It means they rotate weekly, he said. “From the outcomes of today’s meeting, it seems whatever hiccup was there, it has been partly resolved because they are still saying they are still busy with the legal side of issues,” he added. “This thing that they’ve just told us today that on the first of October as promised we are going to be Wits staff it still needs to be seen because there’s little time. We are happy to hear those news but we are not completely overjoyed,” said Ndlovu. Wits Vuvuzela, Wits insources 1200 more workers, August 04, 2017. Wits Vuvuzela, Insourcing high turns sour, February 24, 2017.